It doesn’t matter if you are six feet tall or four and a half feet, growing spiritually happens an inch at a time. Whether we are short or tall, our Soul’s growth can be hard to measure. Courage, faith, time and patience can be impermanent. Just remember there is no fast track to becoming more conscious. We don’t all grow at the same pace, not in our spiritual body anyway. There are lots of charts and statistics that say what size our physical body should be and what it should look like at a certain age, but there are no diagrams of what our spiritual being should resemble at any stage of life. Being courageous enough to walk along an emotional path is without a doubt something to be very proud of. It may well be the most rewarding thing you will ever embark upon. There is no better way to inspire the rest of the world than to be a leader in something that takes real guts to embrace and achieve. Personal growth can be measured like the annual growth rings of a tree. Each ring shows the amount of wood produced during one growing season. Our growth isn’t measured in wood, of course, but instead in how much we evolve our Soul with each challenge we face and overcome. Tree rings grow under the bark, and the bark is pushed out while the tree is growing. As humans we grow inside also, and the more we grow, the more we expand our emotional intelligence and push old patterns away. 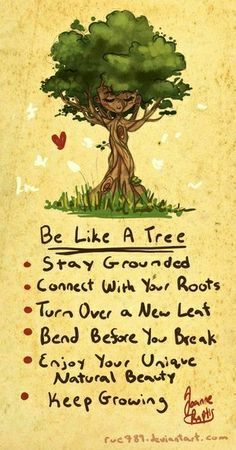 I love the tree analogy because nature allows us our greatest expansions. It is when we absorb ourselves in what Mother Earth so graciously provides for us that we are able to feel the most connected to what really matters. When we are able to join hands with the true nature of our own Soul, the incredible link to why we are here on this earth is established. It is not enough to say that we are a spiritual being—we have to become one before we can make a secure connection to ourselves. Growing an inch at a time, that is the pace of spiritual growth. If we were to push ourselves any faster, we wouldn’t be doing the task at hand any justice at all. There is no fast track, shortcut or Cole’s Notes, sorry! There will be lots of tests and a final exam in each evolutionary step—sorry about that too! What I am not sorry about are the rewards that come from each inch you manage to sprout. What digs its way to the surface from deep within you, what awakens with the fertile energy you discover, will awaken you and enhance your life in so many unique and magnificent ways. Stay on the path, nourish your Soul along the way and be a witness to your own growth. It is there for you to see, an inch at a time.